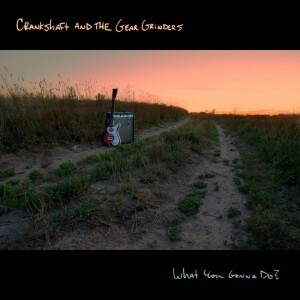 Review: Crankshaft and the Gear Grinders – What You Gonna Do? I recently had the pleasure of being asked to review Anoka County, Minnesota’s Crankshaft and the Gear Grinders’ 2013 release What You Gonna Do? and I must say – it is a music lover’s dream. Every so often there is an artist that comes along so true to self that it seems as though they couldn’t possibly play a bad song if they tried. Anything I write here is going to become irrelevant once you listen to a few songs, but allow me to break down a few notes on what makes this an instant favorite. In any musical offering, from a solo acoustic guitar to the 35 piece jazz ensemble, there is a recipe that exists to contribute to that sound. It is made up of style, influence, culture of the artist, writing/playing ability, and any number of other “ingredients.” With this in mind, let me highlight a few things that stood out to me as a fan of music, as a musician, and as a critic. STYLE: Oh, it’s distinct. Yes, it jumps around from the high-energy, raw 60s dance party/rockabilly; “When The Lights Go Out,” with its dare-you-to-keep-up key changes and super hooky rhythms and easy to follow lyrical style blending wonderfully; to the pure Chicago blues number “Trail of Tears” two tracks later. Yes, “Kingpin” is perfect 60s lounge groove that made me wish I had a hot rod to go cruise for chicks in. Yes, there are soaring dynamics that allow songs like “I Wanna Play,” a shuffle, jazz reliant on a “drunken Trumpet” and some damn fine delicate piano to lead the march, to not feel at all out of place. In honesty there are a few tracks that, absent from vocals, you wouldn’t think they are the same artist. Not since Nazareth have I seen this on this level (seriously… how is “Love Hurts” on the same record as “Hair Of The Dog?” How is that even the same band?!). One thing’s for certain, it’s a sound all its own. INFLUENCE: Far and wide, but let’s say the boy knows his blues. Alex Larson is a one-man arsenal and on this record brings in a band to round out songs that he plays comfortably and capably on his lonesome. Taking cues from Richard Johnston and the like, Larson often performs as Crankshaft with a guitar, bass drum, and hi-hats and snares rigged to pedals. I’ve seen Nick Schnebelen of Trampled Under Foot sit down behind a drum kit, guitar in hand, and play a tune. It was, in a word, intimate. It’s an invitation into a vulnerable setting, and all these men mentioned do it spectacularly. Larson/Crankshaft, in particular, has a style of writing and playing that seems to bend around song like a wayward kite round a tree branch. Once he has his touch to it, it’ll never separate. THE “HOT DAMN” FACTOR: Crankshaft has a way of steering groove in a way that isn’t contrived or even discovered as much as it is conjured into existence; songs like “Let Me Love You,” “Barkin’ Up The Wrong Tree” and “Kingpin” I’ll once again use as a brilliant example of this. Progressively, the groove is laid down, thicker and stronger, piling on layers of drum, horn, keys and guitar; dropped like the desperate and reckless ties under a railroad track being built while the locomotive steams steadily ahead. With easy grace and style, Larson leads the Gear Grinders masterfully through this collection, falling easily in place with the saints of blues music such as Jimmy Yancey, Earl Hines, Hudson “Tampa Red” Whittaker, or even Sleepy John Estes. Do yourself a favor, buy this CD, grab your cruisin’ partner, gas up the car, and then…wait till you’re a good twenty minutes out of town before blasting this CD. After that, enjoy where the roads and the music decide to take you. This entry was posted in Reviews and tagged 2013, album, Alex Larson, CD, Crankshaft and the Gear Grinders, Minnesota, music, review, What You Gonna Do? by Greg. Bookmark the permalink.